I'm home for spring break right now. Every time I come home during breaks or long weekends, my family likes to celebrate by having something special for dinner. The thing is, we always celebrate by having the same thing – fresh crab or seafood hotpot. Chinese folks tend to see seafood as the ultimate celebration food, so it's always a special treat for when I come home. In fact, every time I go home, my boyfriend can predict that I'll be eating crab or hotpot at some point during my stay haha, and he's always right! In my hometown, there aren't any large Asian markets like there are in Boston, but there are lots of small Vietnamese grocery stores. My parents happen to know one of these stores gets new seafood stock every Thursday, so this Thursday we dropped by and had our pickings of the best and freshest blue crab in the store. They were live and kickin, always a good sign of freshness. Blue crab is probably my favorite crab variety, as they have the tenderest and finest meat of any crab I have ever eaten. While the crab itself is usually quite small (about the size of my hand) and does not have a lot of meat, the meat it does have is sweet and silky. 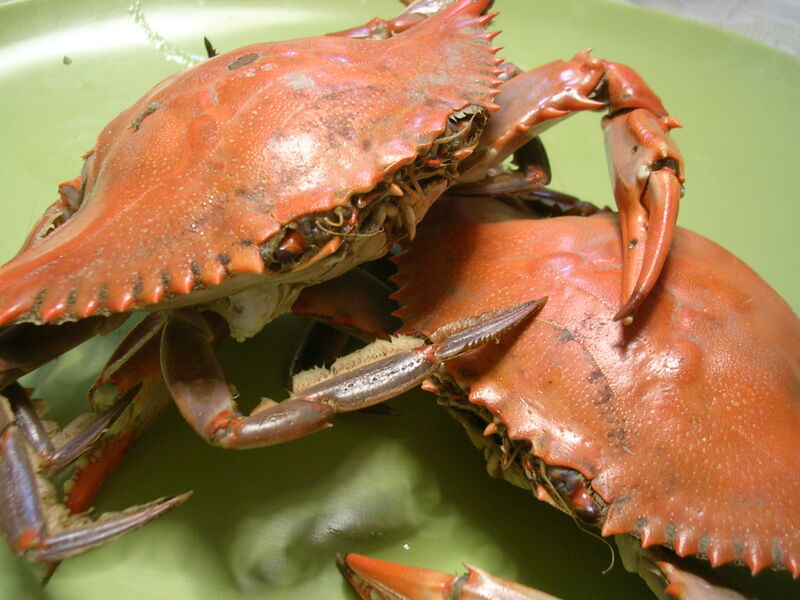 In comparison, other larger crabs like the dungeoness, rock crab, and Alaskan king crab all have very thick fibrous meat, where the fibers are large and sometimes quite chewy. For the most delicate of crab meats, I always go to blue crab. They're nasty little suckers to try and dig into, but you are well-rewarded for your hard work! Right now also happens to be the breeding season for blue crab, as all the crab we bought this week were filled with bright orange crab roe (eggs) that are considered a delicacy. We also usually prepare a starch on the side to eat, as the crab alone may not fill you up, or leave you hungry later in the evening. Dumplings are a popular choice, or something like a stir fried noodle dish. This time, my mom had picked up a few packages of freshly steamed flat rice noodle sheets rolled up with dried shrimp and scallions from the Vietnamese market. After just a nuke in the microwave, they were ready to be served with a dallop of hoisin sauce. 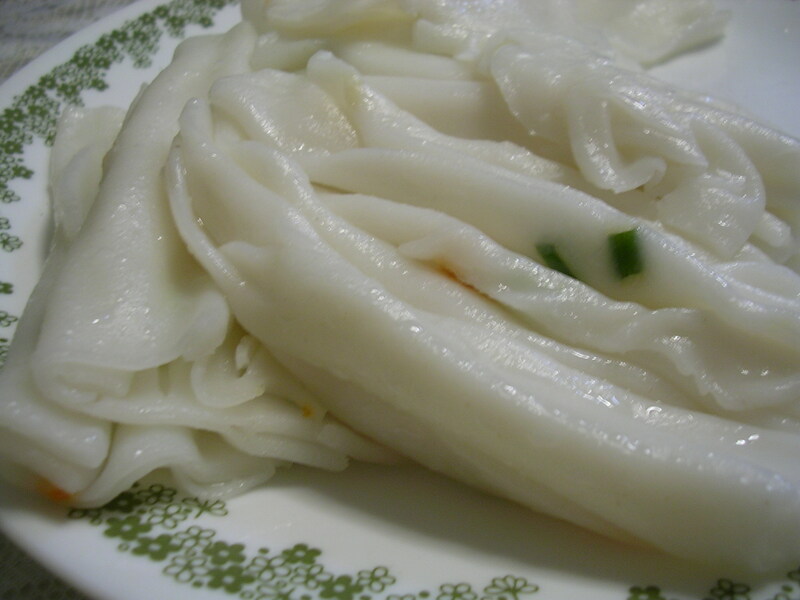 These rice noodle sheets are delicious and soft, and are used to make the popular chow foon dishes (also called he fun in Mandarin). Finally, my mom prepared a tasty soup of spinach, mushrooms, snow peas, and pork blood. That's right, I did say pork blood. Now don't freak out on me… pork blood isn't actually liquid blood. It's blood that's been solidified (by congealing I think) into a block whose texture resembles tofu. It's a pretty popular ingredient in Asia. You buy it in rectangular blocks, and then you dice it or cube it into small chunks to be cooked in soups or dishes. Pork blood has a very distinctive texture – something of a mix between firm tofu and liver. The flavor itself is pretty mild, I would say it's similar to a very mild liver. It sure makes for an interesting form of protein in soup. 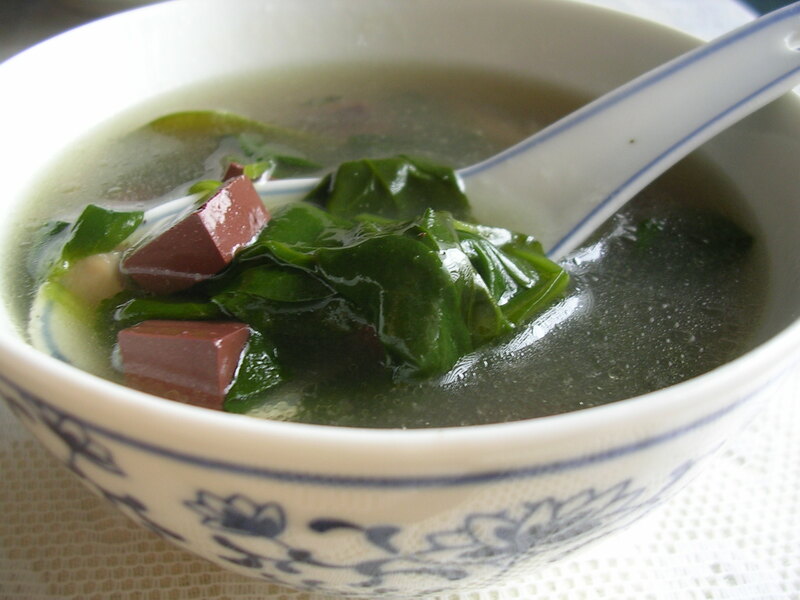 In China, one of the most popular variations is to use chicken or duck blood in soups. For some reason, chicken/duck blood has a very soft and delicate texture, very similar to silken tofu, and is therefore preferred by most people over pig's blood. I know this is probably grossing you out, but it tastes pretty good. Just don't think about liquid blood and you'll be okay… it's sorta like a pate! This entry was posted on Saturday, March 29th, 2008 at 5:16 am	and posted in Chinese, cooking, seafood, soups, Uncategorized. You can follow any responses to this entry through the RSS 2.0 feed. Hope you're having a nice Spring Break! Thanks! Sorry that you developed a seafood allergy… it's so weird how that can happen randomly in life. It must be tough having to stay away from that entire food category! I hope your job search is going well!